Over the weekend a surfing competition was called-off for an unusual reason. 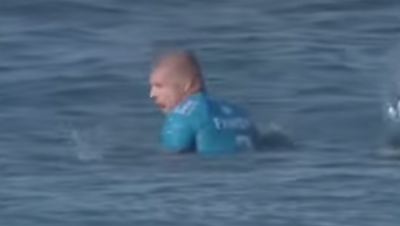 At the J-Bay Open in Kouga, Eastern Cape, South Africa, three-time World Champion Mick Fanning was attacked by a shark - yet he escaped unscathed, protected by his wits, his fist, his leg rope and some rapid action by rescue-support staff. The incident was televised and the video, understandably, has gone viral. From a body language perspective - a shark attack certainly provides some profound nonverbal illustrations of fear - yet rarely are they captured on film. Although this frame from the video is of low-resolution, we can certainly see Fanning's mouth - it is transitioning (extremely rapidly) from surprise to fear. Surprise has the shortest duration of any emotion. It rapidly (and in this example, very rapidly) is replaced by another emotion - such as joy-happiness, anger, etc. - and here of course FEAR. 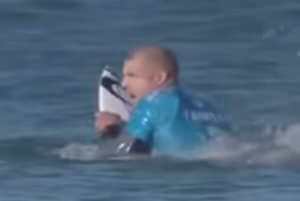 In this image - just 0.5 seconds later (3:58.7) we see Fanning's mouth take on a full fear expression. Note the corners of his mouth pulled out (laterally) and down. 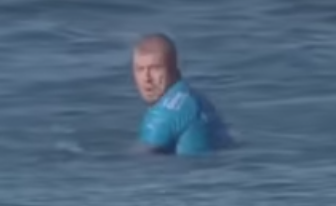 Less than 2 seconds later (4:00.3) we see Mick Fanning's face once again - and we are not surprised to see this same fear expression persists. Nonverbal Communication Analysis No. 3251: Donald Trump's Body Language Response to the question, "Have you ever asked God for Forgiveness?"